Bolden plans to announce which lucky museums will receive the three flown space shuttle orbiters – as well as the test orbiter Enterprise, which never flew in space – tomorrow from NASA's Kennedy Space Center in Florida. 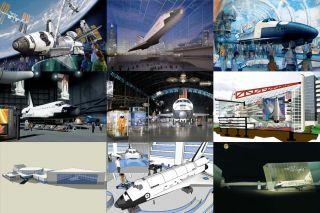 The Kennedy center, along with NASA's Johnson Space Center in Houston, the Smithsonian National Air and Space Museum in Washington, D.C. and 18 other space museums and institutions are all vying for the chance to display a shuttle. "I think you will find when the announcement is made that every place receiving an orbiter has a historical connection to the space shuttle," Bolden revealed during a hearing of the U.S. Senate's Commerce, Justice and Science subcommittee. "This process has been as pure as I could make it and free of any political involvement," Bolden said. "I can say that till I'm blue in the face but there will always be someone who will have the opinion that that is not the case." Several senators could not resist putting in last-minute pitches for their districts during the hearing. "It just seems to me that it will be very difficult to leave out both Houston and Florida," Hutchison said, arguing that Johnson Space Center and Kennedy Space Center deserve orbiters. "I think you have acknowledged as well that when people think of our space shuttle," they think of Houston and Cape Canaveral. Senator Sherrod Brown, D-Ohio, took the opportunity to point out how many visitors Ohio receives, and how many Ohioans have been key players in space history. He asked Bolden to clarify what has been a somewhat mysterious process of choosing the retirement homes for the space shuttles. Bolden said there were 10 criteria on which he was basing his decision, and he planned to make a final choice this evening. There were 29 intial museums in the running, though eight have since dropped out. "There will be 25 people who won't be happy," Bolden said. "Four who will be really happy." NASA plans to hold a ceremony at 1 p.m. EDT (1700 GMT) tomorrow to commemorate the 50th anniversary of human spaceflight and the 30th anniversary of the first space shuttle launch. The announcement about the fate of the retired orbiters will take place during the ceremony, to be held outside the hangar for shuttle Atlantis, known as Orbiter Processing Facility-1. The event will be open to Kennedy Space Center employees. A press conference will follow, the space agency said.